Yesterday I became ambitious and decided to dust off my pasta machine and get cranking. Sadly, the demonization of carbohydrates has relegated my once coveted appliance to the top shelf where it has been gathering the proverbial dust. I'm tired of not eating one of my very favorite foods and so I assembled the ingredients. Throw it all in the food processor and process until it adheres and forms one or two balls (add more flour if it's too sticky; dribble in a little water if it fails to come together). Knead on a floured board for a minute or two until the dough is silky and somewhat elastic (it'll still be rather stiffish). Wrap in plastic and rest in the refrigerator for an hour. Remove, divide in two and return the unused portion, wrapped back in the plastic, to the refrigerator. Now for the fun part. Flatten the dough with your hands and run through the lowest setting of your pasta machine. Fold the two ends into the center and run it through again. Repeat. Move up to #2 setting and run through twice. Then, run the dough through each of the settings--taking care to dust generously with semolina--until you get to the second to last one. 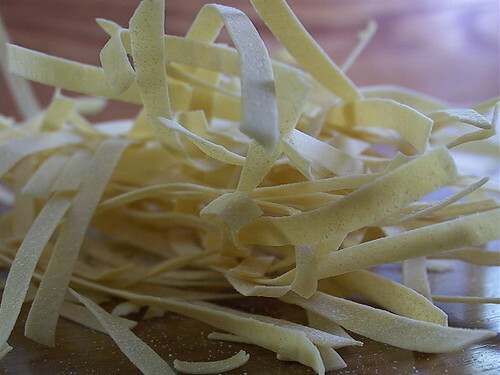 Cut your enormously long pasta noodle in half, and again, dust very generously with semolina. Attach your pasta cutter to the other side of the machine, and carefully roll the dough strip through, separating each of the strands. Hang on dowels or, like me, the back of a chair. Repeat with the other dough strip and then repeat the entire process with the other ball of dough taking it easy in the fridge. You should have enough for two adults and two children. You can either use the pasta right away (it should only take a minute or two to cook up in boiling, salted water [use a tablespoon or two of salt]) or leave it to dry, about three hours (now the pasta will take about five minutes to cook). For the mussels, I used Mario Batali's admirable recipe (here's a link to it). My only change was, instead of halving the recipe for two, I simply reduced the wine, garlic, shallot, and onion mixture down to a quarter of a cup or so and then added the mussels. I always think the steaming step in the cooking process of mussels and clams dilutes the sauce to its detriment, so this seemed a method to intensify the flavor sufficiently. The bread crumbs sounded unappetizing to me, so I omitted them. It turned out beautifully and my oldest daughter even ate a few of the mussels with her plain, buttered pasta. That, to me, is success. Interesting--I don't think I ever made pasta with bread flour. I'll have to try it. I think the bread flour-based pasta dough is easier to roll out very, very thinly. I still can't help but feel a twinge of guilt over all those lovely carbs. Moderation is a great concept, but lordy, it's so hard to live by it!